If you prefer to speak with someone on the phone with local experience and knowledge of all things golf in Mesquite, Nevada, please call us at 702-487-3139 we're happy to help you. We are experts in Mesquite Golf Packages! 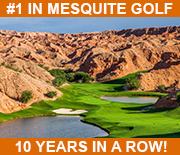 ©2019 MesquiteGolfCourses.com. All Rights Reserved.